Frontage - The property has a front forecourt garden with stone walling to the front, blue slate chippings and paving and wrought iron railing steps leading to the front door. Entrance Hall - 2.33m x 2.02m overall (7'8" x 6'8" overall) - With composite entrance door with two obscure glazed panels to the front elevation, sensor activated lighting, large format tiling and built in utility/cloaks cupboard off with enough space for coat pegs and wall mounted Ideal combi boiler with space and plumbing for washing machine, electrical consumer unit and intruder alarm control box. The hall itself offers a thermostat for the underfloor heating, intruder alarm control keypad, ceiling light point, mains powered smoke alarm and staircase with winding treads rising to the first floor. Open Plan Lounge/Dining Kitchen - Lounge area 5.90m x 3.58m min (Lounge area 19'4" x 11'9" min) - In modern fashion, the property's living space is open plan with amtico style timber effect flooring throughout and ample space for both seating and dining with French doors and matching side screens overlooking the rear garden. Ceiling light points and down-lights throughout, digital under-floor heating thermostat, plentiful power points and TV/BT open reach sockets. Kitchen - 3.91m max x 2.70m (12'10" max x 8'10") - The kitchen area is fitted with an attractive range of modern style satin finish units to base and eye level with contrasting attractive silestone work-surfaces with matching up-stands, under cut stainless steel sink, cut in drainer, in-built Zanussi dual oven/grill with separate four ring induction hob, integrated Zanussi dishwasher and microwave, fridge plus freezer units. Additional storage with soft closing doors and drawers, extractor hood with glass splash-backs and sash cord style UPVC double glazed window to the property's front elevation. Wc - 1.65m x 1.23m (5'5" x 4'0") - Having large format tiling and wall tiles to dado height, wash basin with mono-block mixer and storage beneath plus close coupled WC with push button flush, ceiling down-lights and extractor. First Floor Landing - 5.29m x 2.19m (17'4" x 7'2") - With decorative balustrade overlooking the stairwell and matching staircase rising to the second floor accommodation, two pendant light points, smoke alarm and radiator, digital central heating thermostat, UPVC double glazed window to the front elevation and useful built-in storage cupboard with light off at the side. Doors give access off to bedrooms two, three and the family bathroom. Family Bathroom - 2.16m x 2.17m (7'1" x 7'1") - With Villeroy and Bosch three piece quality suite comprising WC with concealed cistern and push button remote flush, suspended wash basin with storage beneath and mono-block mixer plus panelled bath with glass shower screen, mains fed shower unit and full height tiling, low voltage down-lights and extractor fan, shaver socket, obscure sash style UPVC double glazed window and chrome finish towel radiator. Bedroom Two - 3.88m x 2.66m (12'9" x 8'9") - Having ceiling light point, radiator, UPVC double glazed sash cord style window to the property's rear elevation. Bedroom Three - 3.57m x 2.66m (11'9" x 8'9") - Having ceiling light point, radiator, UPVC double glazed sash cord style window to the property's front elevation. 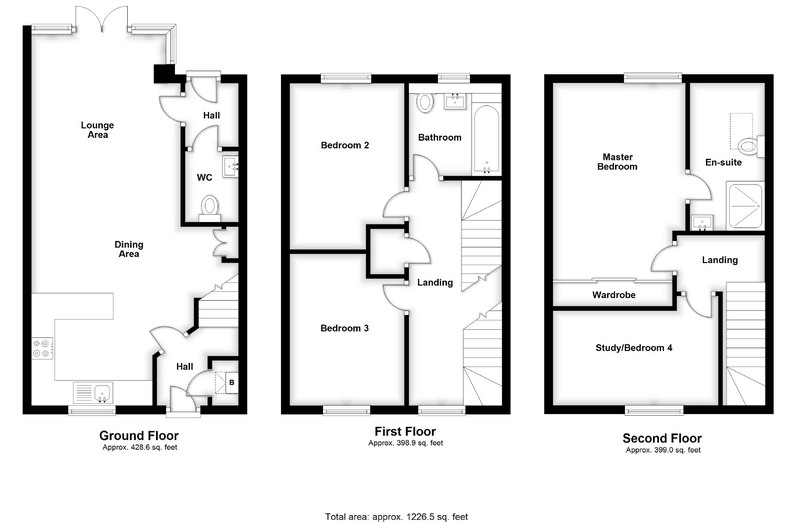 Study/Bedroom Four - 3.88m x 2.30m (12'9" x 7'7") - With limited ceiling height due to sloping ceiling pitch to the majority of the room, ceiling light point, radiator and UPVC double glazed sash cord style dormer bay window to the front elevation. A sizeable room which could easily be used as a childs bedroom, home office or dressing room to the master bedroom which is adjacent. Master Bedroom - 4.58m x 3.09m (15'0" x 10'2") - With fitted wardrobe filling one entire wall having a range of hanging and storage within with three section sliding doors to front, ceiling light point, loft access hatch and plentiful power points plus radiator, UPVC double glazed sash cord style dormer bay window to the front elevation, TV socket and digital thermostat controlling the en-suites under-floor heating. En-Suite Bathroom - 3.45m x 1.74m (11'4" x 5'9") - With contrasting floor and wall tiles and a three piece suite comprising double size shower cubicle with mains fed shower unit and separate hand shower, suspended wash basin with storage beneath and mono-block mixer, close coupled WC with push button flush, chrome finish towel radiator, ceiling down-lights, double glazed Velux style window to the rear elevation. Rear Garden - The rear garden is entirely paved and/or laid to artificial turf with walling to the boundaries and fencing to the side providing a low maintenance outside space in which to relax. There is also an outside water tap and light.